Easter isn’t all about decorating eggs and watching for the Easter Bunny. It’s also about the food. Whether you are planning a big Easter dinner, a small brunch or you just want a few recipes to create delicious and fun treats for your family, there are literally hundreds of things that you can make. 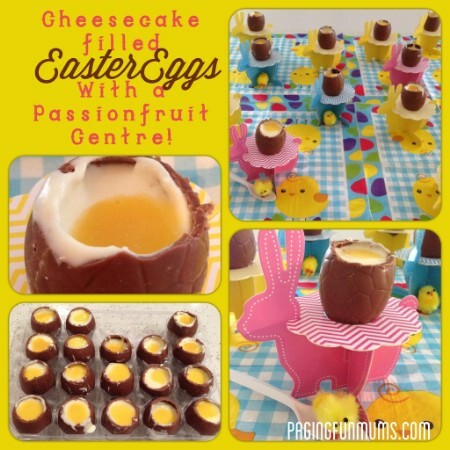 In fact, we have collected 100 great easy to make Easter treats that are sure to thrill your family and friends. From homemade Cadbury eggs to many different ways to decorate an Easter Bunny cake, it’s all in here. 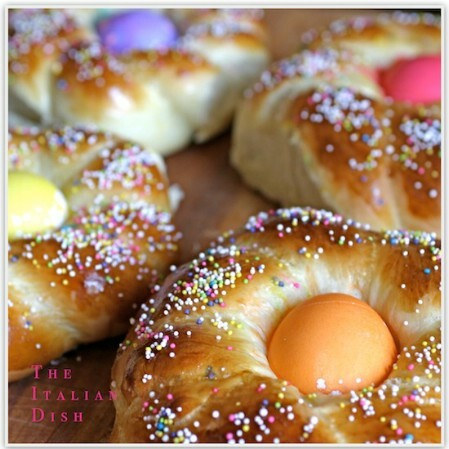 There are also traditional recipes like Easter bread complete with a decorated egg baked in the middle and various other not so sweet recipes. Whether you are planning a party or you just want to make your own little Easter a bit more special, you are sure to find loads of great treats to make in this collection. 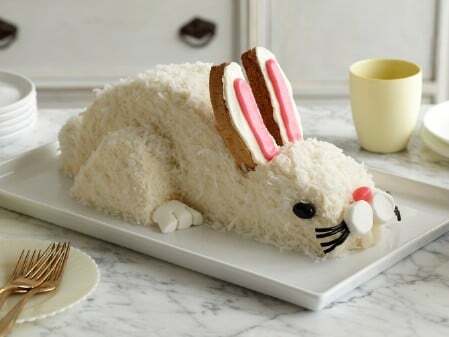 No Easter party or dinner is complete without a traditional Easter Bunny cake. This one is really easy to do and uses coconut for the fur. You can also color some coconut with green food coloring to give your bunny a bed of grass to lie on. Marshmallows make up the feet and nose and the ears are made from yummy biscotti. This is a very easy bunny cake to make and is sure to be the perfect dessert for your Easter dinner table. Ice cream cones, jelly beans and licorice make the most adorable little Easter baskets. You can fill these with whatever small candies you want but the jelly beans are colorful and look great. The handle is made from licorice and each basket takes only minutes to create. 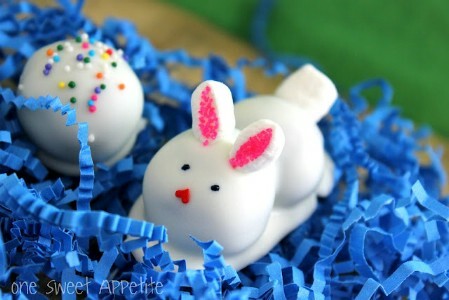 These are great for Easter parties or egg hunts when you want something cute and easy to give out as favors. You could also fill the baskets with green colored coconut for grass before you put in the candies if you like. So these little cupcakes sort of look like they are meant for Valentine’s Day, but because they have birds in the nests, they are also perfect for Easter. 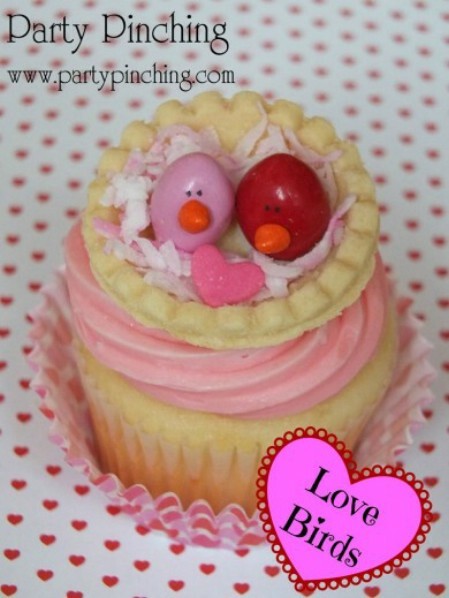 You could do the frosting and jelly bean or M&M candies birds in pastel colors to make them more spring like. The added surprise with these cupcakes is the little mini tartlet on top that creates the nest. 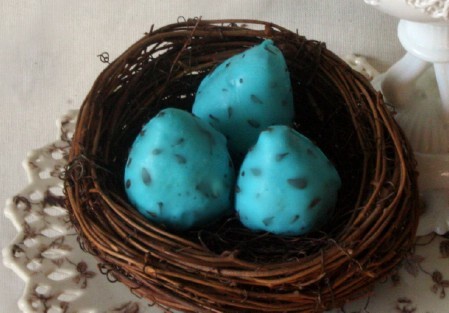 Fill it with coconut colored with green food coloring and add jelly beans for eggs or create the little birds. This deviled egg recipe is an absolute must for your Easter dinner table. 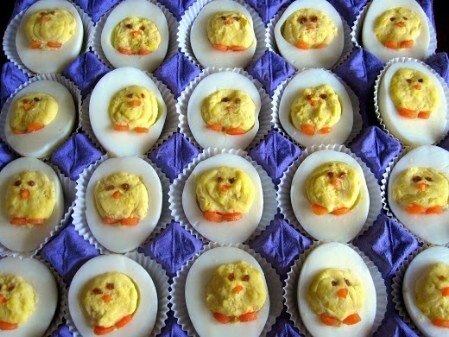 If you are planning on making deviled eggs anyway, why not dress them up a bit? These adorable eggs look just like little baby chicks and the recipe is so fast and easy that the kids can do this while you attend to other recipes. You need tiny pieces of carrots and raisins to create the faces and feet. 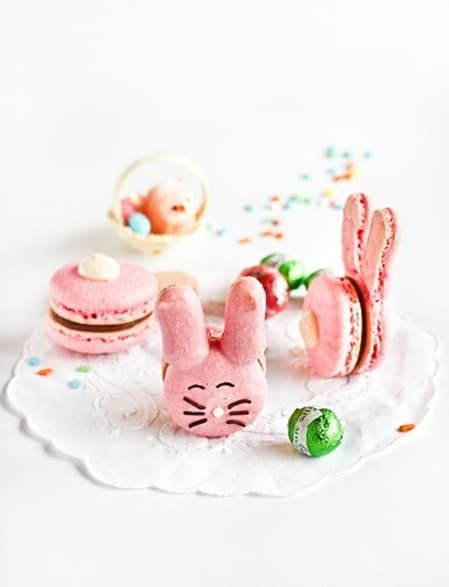 These delicious bunny macaroons have chocolate marshmallow frosting in the middle and are absolutely adorable. They are really easy to make – easier than they look, in fact. You bake the tops and bottoms separately and then assemble them once they are finished. The bottoms even have tiny little white tails and you can decorate the faces however you like. The recipe is in pink but you could do these in different colors if you wanted just by coloring your dough before you bake. Who doesn’t just absolutely adore Cadbury Crème Eggs? The bad thing is that these are usually only available around Easter. 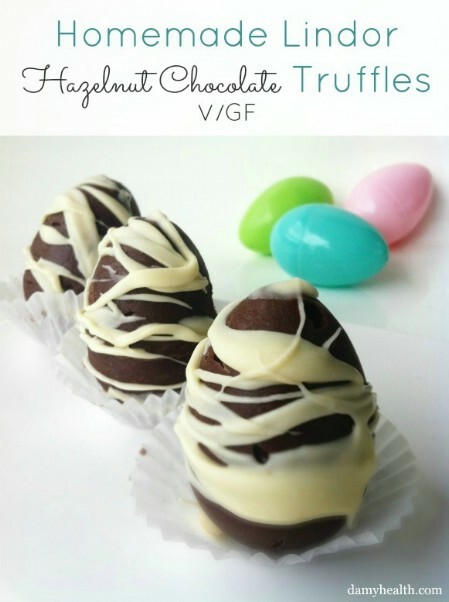 While you are certainly going to want to make these for Easter, it will be great to have the recipe on hand so that you can whip up a batch anytime you get the craving for one (you know, when the stores don’t have them in stock any longer). The recipe is so easy to do and makes about 15 eggs depending on how large or small you want them. This is one of the easiest of all Easter treat recipes. You just have to have a few marshmallows on hand. The really large ones would work well if you really want some huge treats but the recipe just calls for standard sized ones. You will have to decorate the chicks with frosting and jelly beans, M&Ms or other candies for the beak. 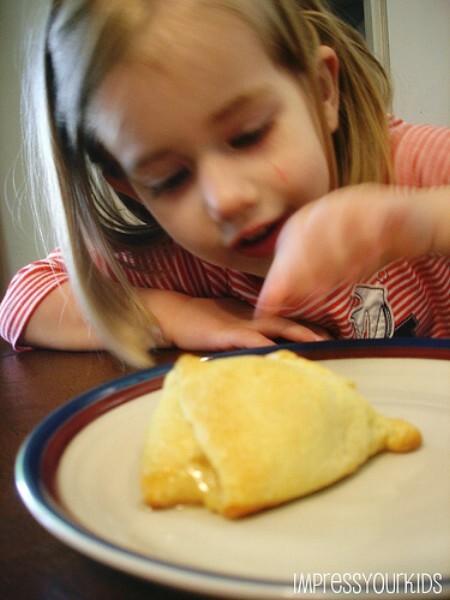 This is such a great recipe and so easy that the kids can do it. 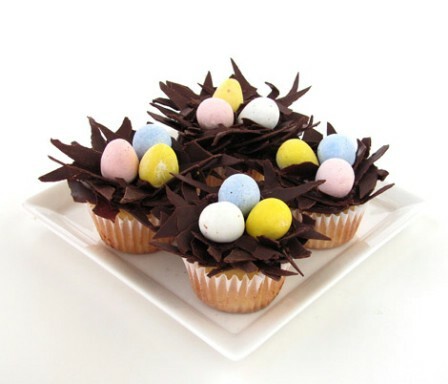 These yummy cupcakes have nests of chocolate on top to hold Easter egg candies. You can use jelly beans or pastel colored M&Ms if you want or robin’s egg candies work well, too. Cadbury mini eggs work really well and come in a variety of pastel colors to make your cupcakes very bright and cheery. You create the nest by melting and then cooling chocolate, which is much easier than it sounds. These delicious chocolate eggs hold a hollowed out center so you can hide other candies in them. They are formed by using real egg shells which gives them a perfect egg shape. The entire process is much easier than it sounds. As long as you know how to blow out the inside of an egg, you can create dozens of these in no time and they are great for egg hunts because the outer shell will help to protect the chocolate inside. Reese’s eggs are wonderful if you love the whole peanut butter and chocolate flavor. If you love Reese’s eggs but you don’t really want to have to pay for them, you can create them yourself. These are made like those great buckeyes for Christmas. You follow the same basic recipe but you create them in egg shapes. Once finished, you can decorate them with sprinkles or go all out and mix up some decorator icing to make them really special. 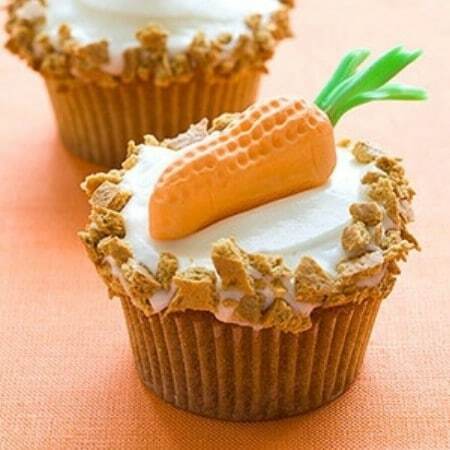 If you want to make something really different for parties or Easter dinner, these little carrot top cupcakes are simply perfect. You make the carrots from orange colored circus peanuts and use green Twizzlers for the greenery at the top. These are so adorable and your little ones are sure to love them. Even kids who hate eating their veggies are going to love biting into these little carrots. Rice Krispies treats are great. Not only are they delicious, they are easily moldable so you can do so many different things with them. 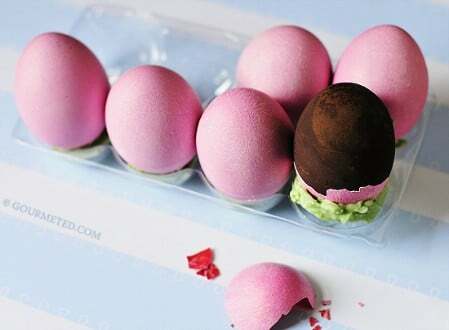 These hidden surprise Easter eggs are sure to be a huge hit with kids and adults alike. 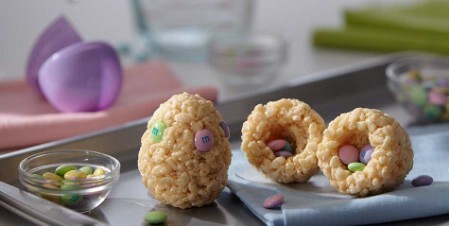 You simply make the Rice Krispies treats, mold them and then hide mini Cadbury eggs, pastel colored M&Ms or jelly beans inside. 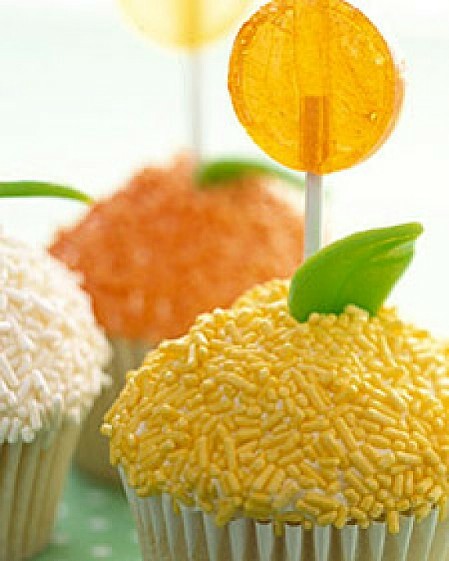 You can decorate them with candies or whip up some decorator frosting if you like. This is a great recipe for brunches or parties. 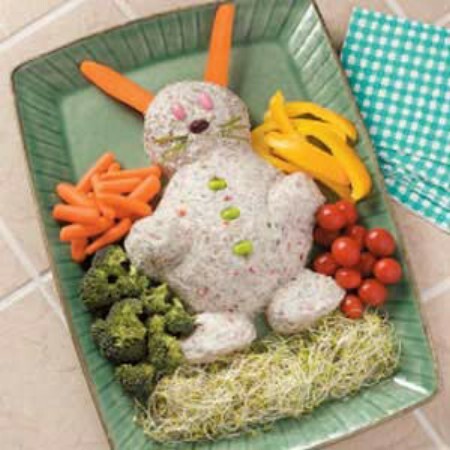 You create the cheese spread (which has cream cheese and deli beef) and then shape it into an Easter bunny. Surround your little bunny with veggies like carrots, broccoli, tomatoes or anything that you want on the plate. You could also use crackers with this if you prefer. The cheese spread takes only minutes to create and you can shape it into any Easter decoration that you wanted. The bunny is just too cute, though. This beautiful cake is the perfect complement to your Easter dinner or brunch. You can make the cake in any flavor that you want and the decorating is much easier than it looks. 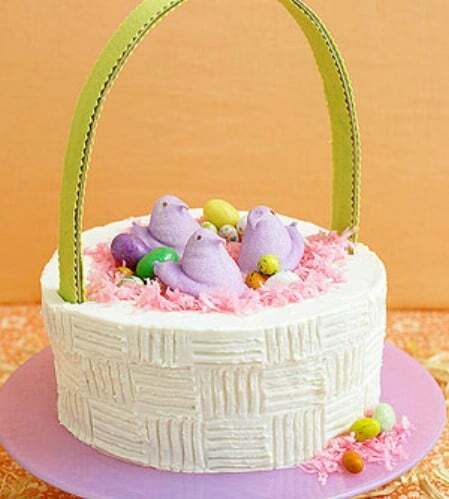 You can use jelly beans, mini Cadbury eggs or robin’s eggs with marshmallow Peeps and green coconut to decorate the top and then create the basket weave in the icing on the sides. Top it off with a handle made from cardboard or you could use Twizzlers if you want the entire cake to be edible. You can mold Rice Krispies treats into just about anything. These adorable little Easter baskets are easy to make and are completely edible. They are perfect for Easter parties. Just mold the treats into the basket forms and then choose what you want to fill them with. Green coconut is a great filler and you can add small candy eggs or even a marshmallow Peep to the basket if you want. The handles are made from Twizzlers. 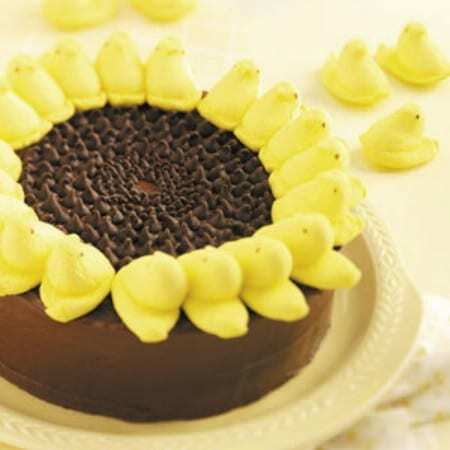 Yellow marshmallow Peeps help to create the look for this delicious and beautiful sunflower cake. Nothing quite says spring like a beautiful sunflower and this yummy cake is sure to be the hit of your Easter celebrations. You can use whatever cake flavor you like – although the recipe calls for yellow. The icing is chocolate and you simply have to pipe in the center of the flower and surround it with Peeps for a beautiful sunflower. This recipe calls for SweetTart brand jelly beans but you could use pastel colored M&Ms if you wanted something a bit sweeter. 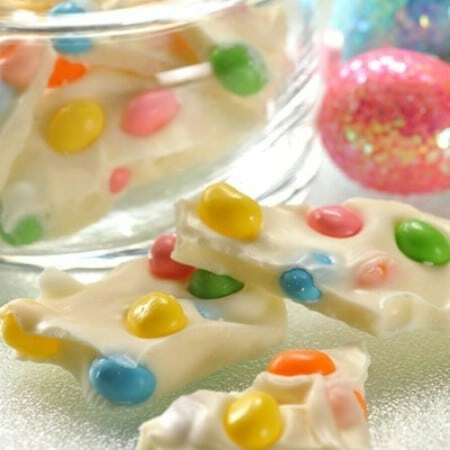 Easter bark is much like peppermint bark that you make for Christmas. You simply melt your white chocolate and then mix in whatever you want to make it colorful and yummy. This is a great candy recipe that will take you less than 5 minutes to make and allows you to be very creative. You could also use regular chocolate if you wanted. These adorable cinnabunnies are just as delicious as they are cute. 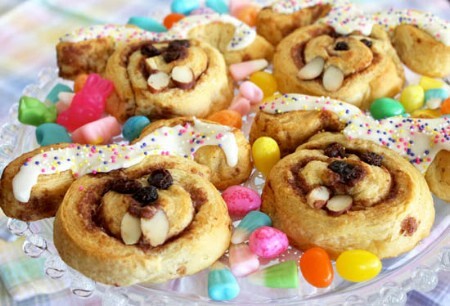 You use canned cinnamon rolls along with almonds, raisins or other embellishments to create the adorable bunny look. These are great for Easter breakfast or if you are planning a brunch, you simply have to make these. They are very easy to make, since the cinnamon rolls are basically made for you already, or you could make them with homemade rolls if you wanted. This is an absolutely gorgeous cake. It’s so beautiful in fact that you may simply not want to destroy it by cutting it. Wait, it’s also delicious so you will have to cut it. The pastel colors are perfect for Easter and the ruffles are much easier to make than you may think. If you are planning to bake a cake for Easter dinner, this is certainly one to consider. 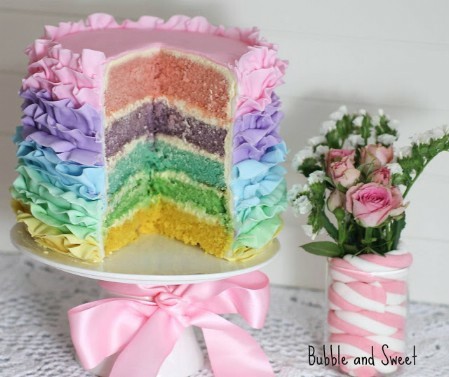 The inside of the cake is just as colorful as the outside so it’s a surprise from start to finish. 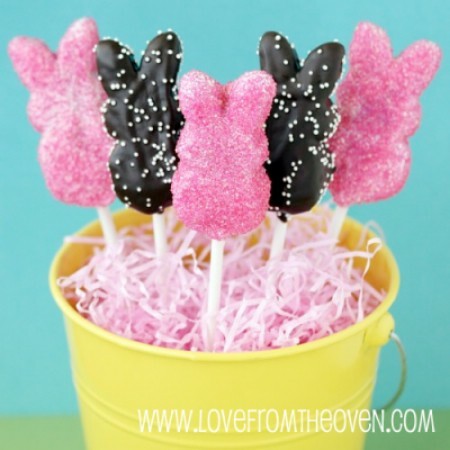 If you have a cake pop pan, this is a great project for Easter dinner. You can create these little egg pops and then display them in an adorable little garden box, complete with grass. 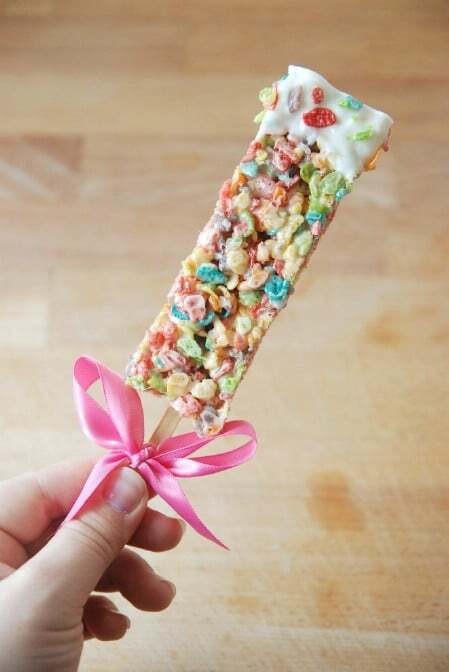 Just decorate your egg pops however you want with sprinkles, icing or anything else you can think of. You can dip in either white or plain chocolate or do a combination of both to make them really colorful. Who doesn’t love S’mores? This Peeps version is absolutely perfect for Easter. You simply substitute marshmallow Peeps for regular marshmallows. 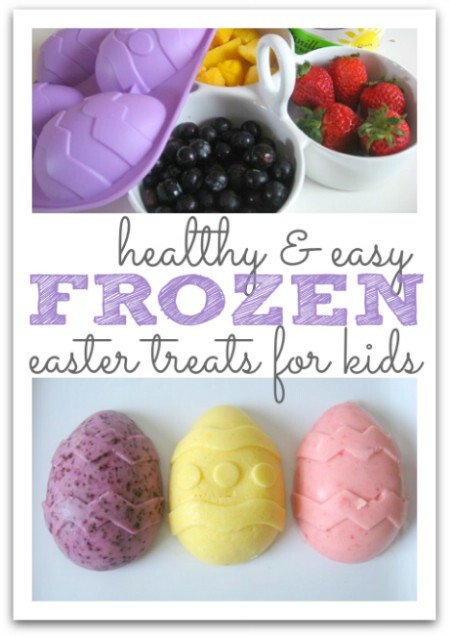 This is a great and very easy recipe that is sure to thrill little ones at your egg hunt. If you are planning a late night hunt or dinner, these are perfect. 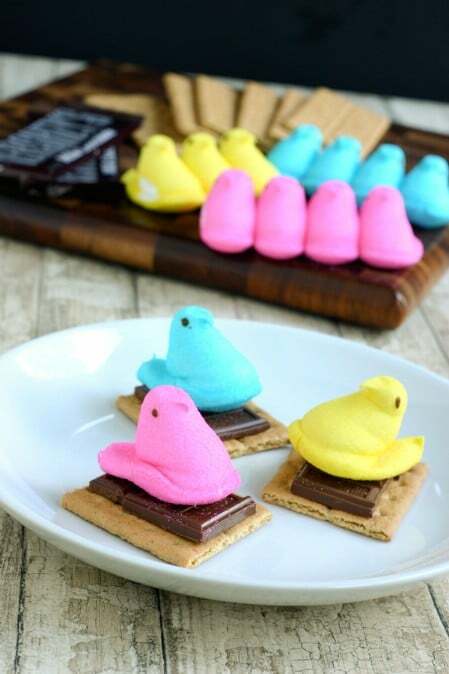 After all, everyone loves S’mores and everyone loves the sweet taste of Peeps, right? Make them ahead if you want for parties and use different colors to get a great pastel colored display. 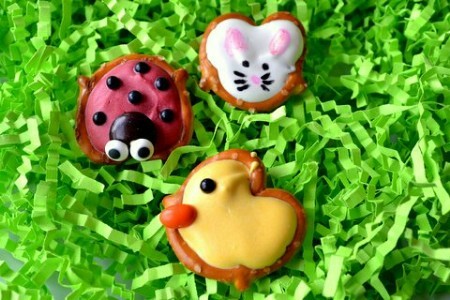 Ladybugs, bunnies, ducks and other characters will come to life when you create these adorable mini pretzel treats. You just need mini pretzels and icings in different colors and you can let your imagination run wild. These are great for Easter parties or to fill up those treat bags. The pretzels give just the right amount of salty to offset the sweet and the characters are just too adorable. No, not real mud. Actually, not real carrots either. 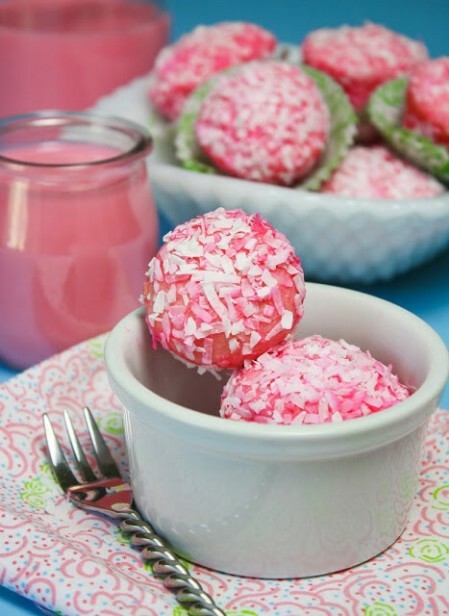 This sweet treat is really cute and really easy to make and kids will absolutely love it. 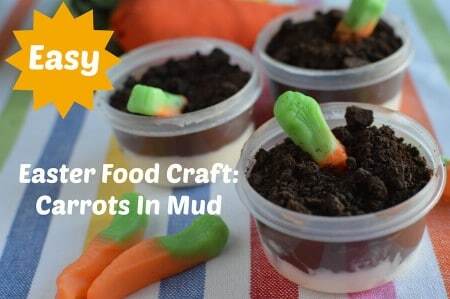 The “mud” is made from pudding and Oreos and the carrots are actually gummies that look just like the real thing. 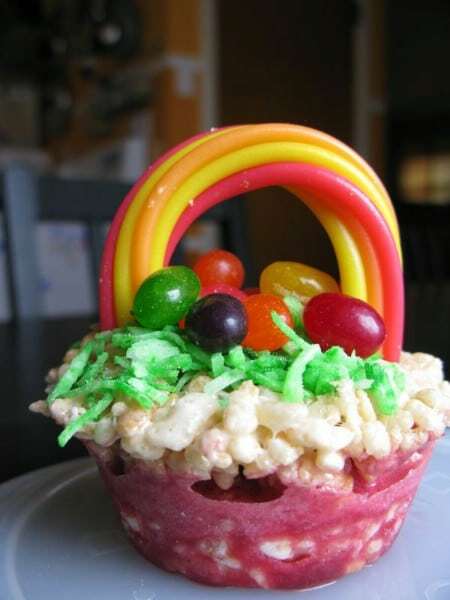 This is an Easter spin on the recipe that uses gummy worms and is created in a flower pot. 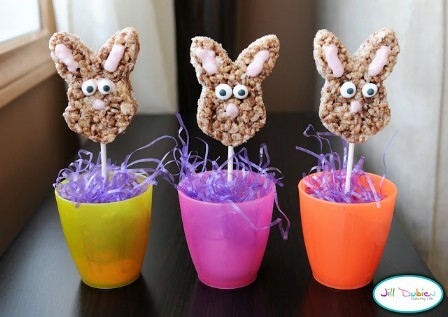 This is a great treat for kids for Easter dessert or would be perfect for those Easter parties and egg hunts. 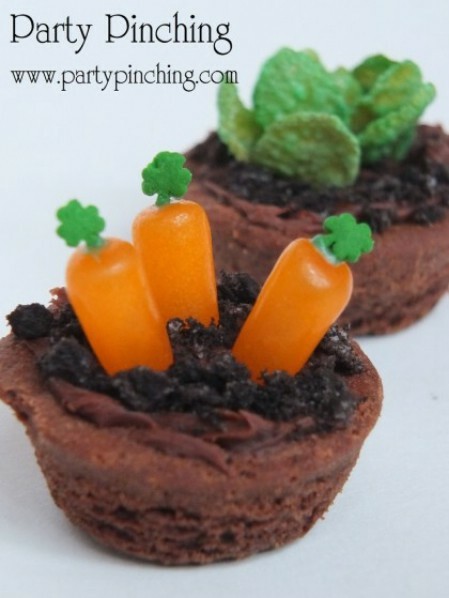 Little mini brownie bites are garnished with things like crushed Oreos, frosted flakes and other embellishments to create an adorable little garden that is delicious. You can color frosted flakes green with icing mist to look like lettuce, use orange candies to resemble carrots and create “dirt” from crushed Oreos. These are very easy to make and you can use brownie bites that are already made or make them yourself. 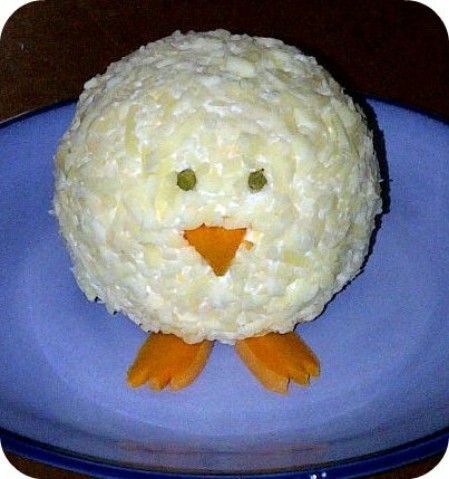 A homemade cheese ball is rolled and formed into a really cute chick complete with carrots for feet and the beak and peppercorns for the eyes. This is a great party recipe or you could just make it for home if your family really enjoys the taste of cheese ball. Serve your little chick with veggies or crackers. He is sure to be the hit of your table and the cheese ball recipe is really simple and takes very little time to create. 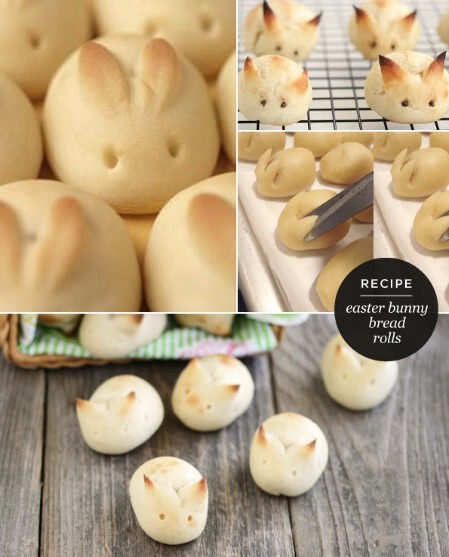 Bread is a must for your Easter dinner and these little bunny buns are the perfect complement to your meal. They are adorable and super easy to create. You will need to buy dinner rolls (the thaw and cook kind) or you could make up a batch of your own if you want. The rolls just have to be twisted and formed to look like adorable little bunnies. Baking time is about half an hour or so but you can make them ahead and have them ready to pop in the oven when your guests arrive. 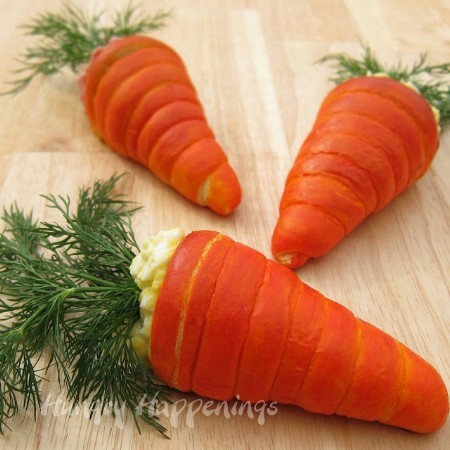 Carrot shaped and colored crescent rolls filled with egg salad are perfect for Easter brunch. 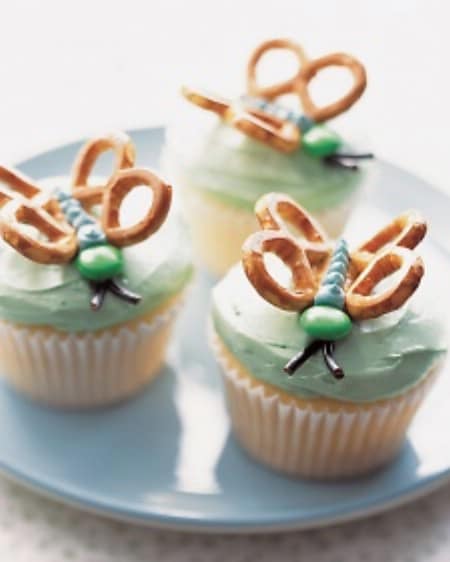 These adorable and very yummy treats are sure to be a hit with adults and kids alike. You use crescent rolls that are already ready to bake and then just color them with food coloring to get the orange look. Once they’re finished, you just fill with egg salad and top off with fresh dill for a real straight from the garden look. 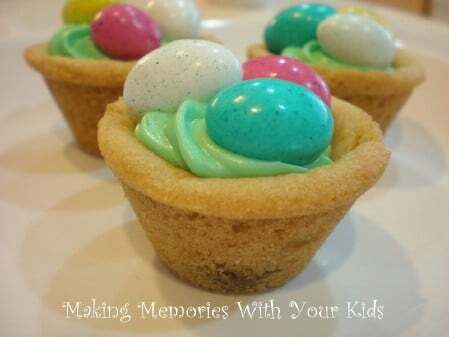 Yummy tartlet shaped cookies give you the perfect basis for these egg hunt treats. You just bake the cookies and then fill with whatever you want. Mini Cadbury eggs and M&Ms are perfect for color and sweetness and you can whip up just a bit of green colored frosting to hold them all together. These are really cute cookies and very easy to make and kids will love helping you to decorate them by filling up the baskets. 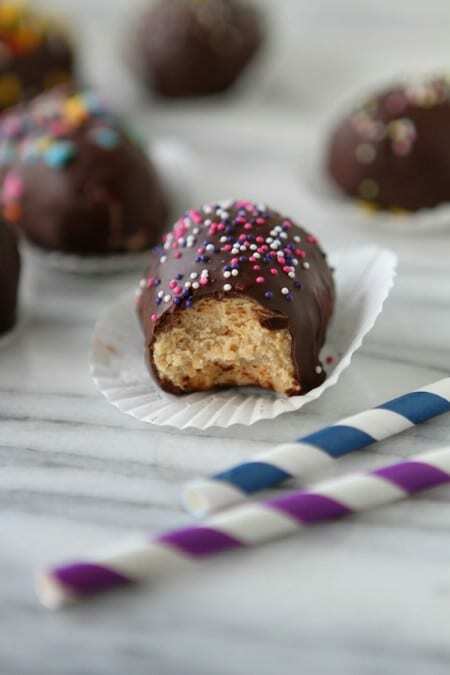 You make these cute little pops using cocoa flavored Rice Krispies and they are held together with white chocolate. You could do them in regular Rice Krispies and use regular chocolate if you want. Once they are molded, just add the decorations to make the face and display them on lollipop sticks. They are adorable in their own little plastic buckets or flower pots or you could put them all together and create a centerpiece. 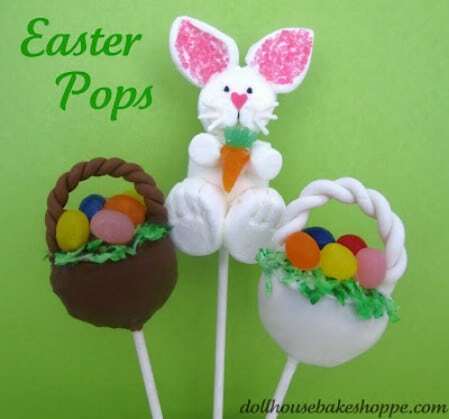 There are many different adorable pops that you can make for Easter. From baskets to bunnies and even chicks and lambs, this recipe will show you how to make them all. These are great for Easter baskets for the kids or you can put together a great gift basket or just create a centerpiece with them for your dinner table. There are pops made from donut holes, cake and a host of other yummy treats. 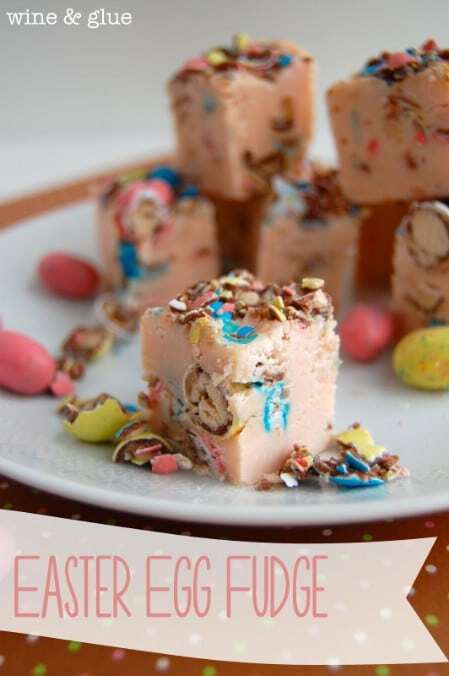 Chocolate chips and mini Whoppers robin’s egg candies are the basis for this delicious Easter fudge. It has all the yumminess of chocolate fudge with beautiful colors mixed in so it is perfect for Easter parties, egg hunts or just to have on hand for those late night snacks. The recipe is super easy and it takes just a few minutes to put together. The whoppers are a great surprise inside the fudge. These delicious rolls are perfect for breakfast or for dessert. They are made with canned crescent rolls, brown sugar and cinnamon and marshmallows. The marshmallows melt inside the yummy rolls, giving you quite a surprise when you bit into one. They are also great for church events so if you are having a watch service or a dinner at your church for Easter, you will simply have to make Resurrection Rolls to take along. 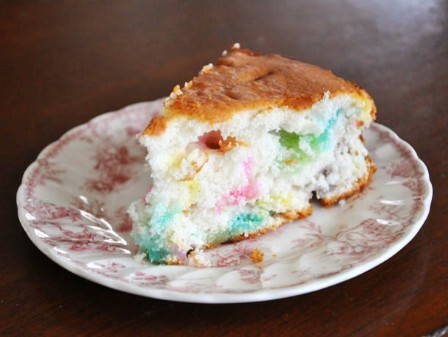 For a really simple (and really delicious) Easter dessert, try this heavenly angel food cake. You will either need to buy an angel food cake already made or you could bake one yourself if you are so inclined. 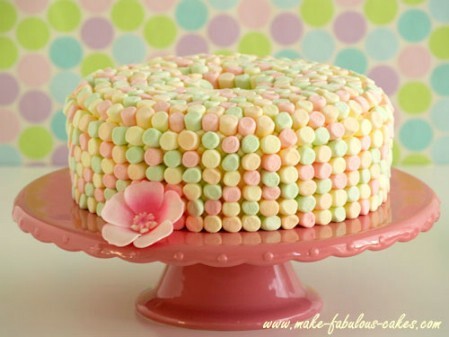 The cake is then frosted and covered with colorful mini marshmallows. It has a wonderful lemony flavor and you could experiment with other candies for decoration if you wanted. Thick pretzel sticks get a sweet twist with these cake batter pretzels. You just mix cake mix (any flavor you want) with melted white chocolate and then decorate them with pastel colored sprinkles. 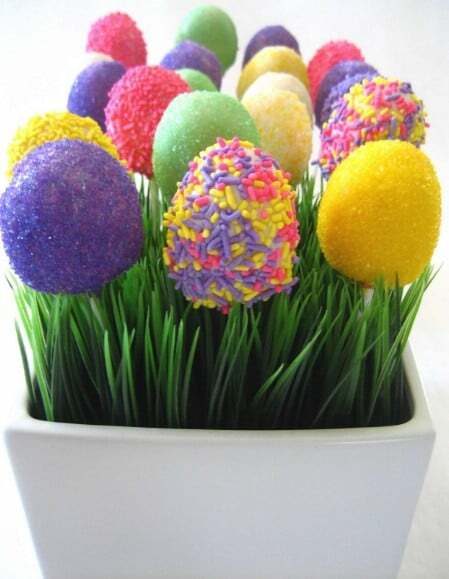 They are sure to brighten up any Easter dinner or brunch table and are perfect for parties and egg hunts. The recipe is so easy that even the youngest of kids will be able to help and kids will love dipping their pretzels in sprinkles and other garnishments. 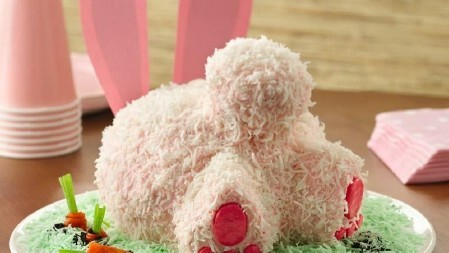 This Easter bunny cake is just too cute and it’s a great twist on traditional cakes with the ears and all. The cake is in the shape of the Easter bunny’s bum and is decorated to make it just too adorable. Do it in whatever cake flavor you want and then you just have to cut and form the cake and surround it with green coconut and a few other embellishments. It’s a really easy way to create a fun and whimsical cake for your Easter dinner or party. Really create a unique and colorful dessert with these little “deviled eggs.” The eggs aren’t really deviled. In fact, they’re not really eggs. 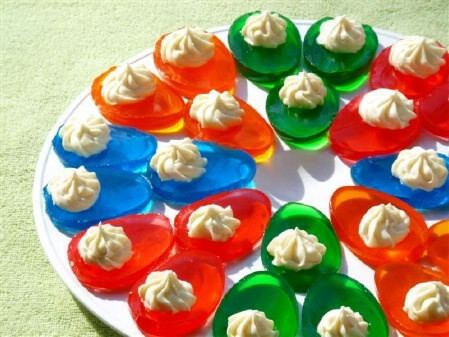 You create the egg shapes out of Jell-O and then fill with a yummy vanilla filling. This is a great dessert or party food idea and is absolutely adorable. You will need a mold of some sort to create the egg shape and you can do various different flavors so you have a lot of different colors. 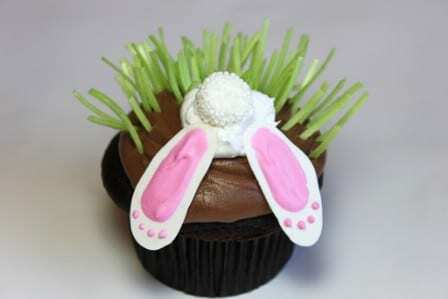 Give your cupcakes a little unique something with this shy bunny idea. 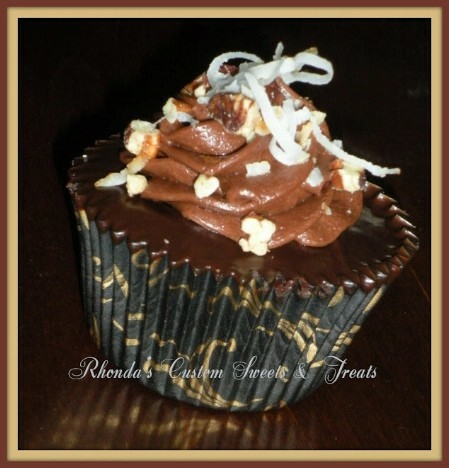 You can use cupcakes of any flavor and frosting of any flavor, although chocolate does look more like dirt. You just have to form the bunny, which incidentally has his head in the dirt. You can either buy edible grass or just use a bit of green food coloring on coconut to make the grass and then decorate with a few candy eggs. These little rolls are so very easy to make, you’ll want to do them for more than just Easter. You start with thawed out frozen rolls or you could make up a batch of homemade rolls if you really wanted to. The bunny comes from how you cut and poke the rolls to make them look like tiny little rabbits. If you really want them to be creative, you could use pepper grains or peppercorns to make the eyes instead of just poking them in. 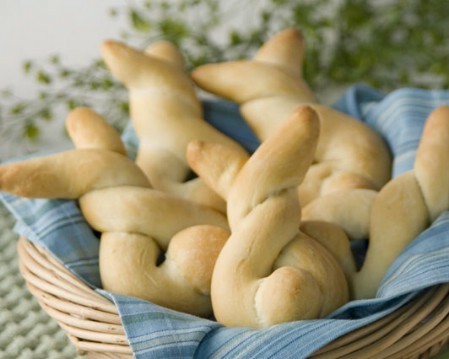 However you make them, these are great for your Easter dinner table. 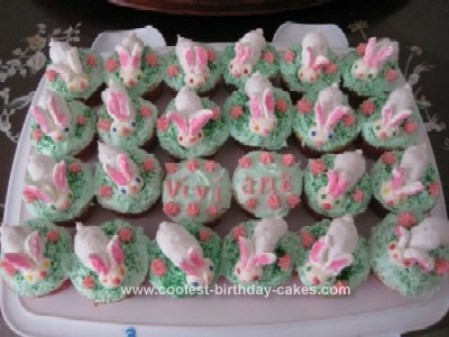 These cupcakes have little bunnies that are made from white powdered donuts and a bit of imagination for the decorations. You can use food coloring to create green frosting or you could use sprinkles or green coconut to make the grass. The bunnies themselves are made from donuts with the heads and tails created from homemade buttercream frosting. They are completely adorable, delicious and one of the easiest Easter cupcakes you will find. Angel food cake is a luscious dessert and when you dress it up with white frosting and decorate with pastel colors, it becomes the perfect dessert for your Easter dinner table. You can make this angel food cake from scratch in just a few minutes and that includes the lemon cream cheese frosting. 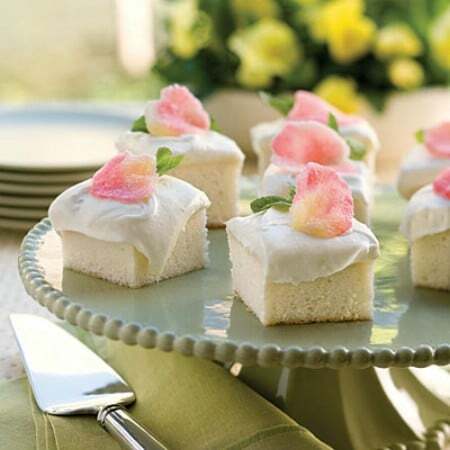 Garnish with gumdrop rose petals, which you can also learn to make in just a few minutes, and you have the perfect springtime dessert for Easter dinner. These adorable little candy carrots are perfect for decorating cakes and cupcakes or you could simply plant them in a bowl of crushed Oreo cookies. Making them is as easy as pie – actually it’s a lot easier than pie. You just need orange colored almond M&Ms – those are shaped more like carrots than peanut or regular varieties – and some green colored Mike and Ike candies for the tops. This Mother Hen and her Chicks are all ready to grace your Easter dinner table. 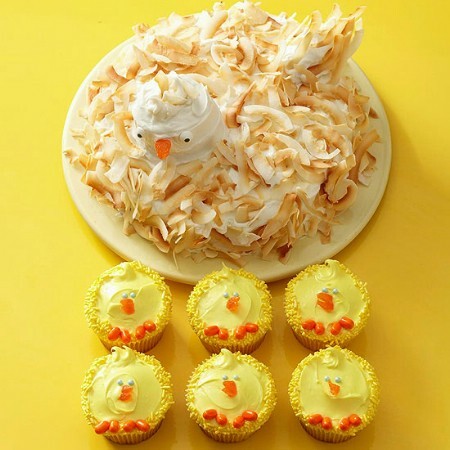 To create this dessert, you just make a cake for the hen and then use cupcakes for the chicks. 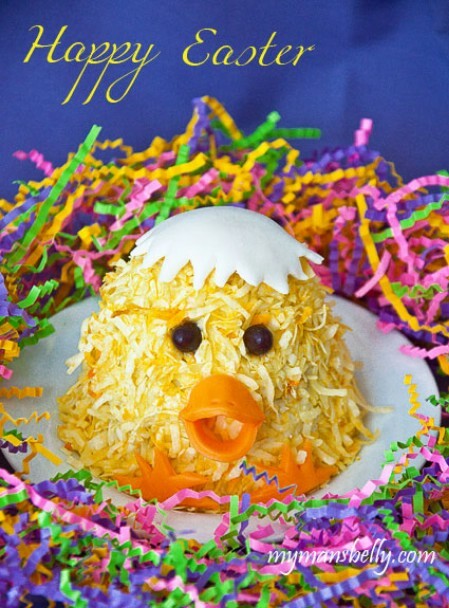 You can decorate the hen cake with toasted coconut to give it the right coloring and add candies for the specific features of the hen’s face. This is great if you are going to have a lot of kids at your dinner. Adults will enjoy the cake while the kids can feast on the cupcakes. 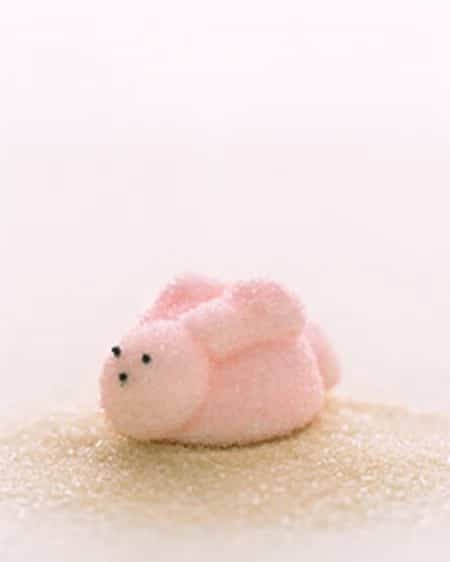 Homemade marshmallows are delicious and you can mold them into various Easter characters like bunnies, chicks or ducks. 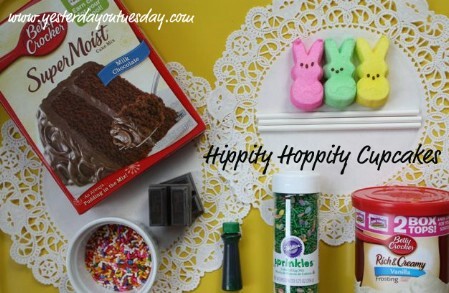 These are great for decorating cakes, cupcakes and other desserts or you could make a batch and bag them, using them in place of store bought Peeps and other candies. They are relatively easy to make and you have a lot of freedom with creativity when it comes to decorating them. Yummy sugar cookies make up these beautiful blossoms that are perfect for Easter parties, egg hunts and just a light dessert. It takes about an hour or so from start to finish and you can make the cookies into any colors you want. The trick is in the cutting. Once you have the cookie dough rolled into balls of the appropriate size, you just have to cut them to create the flower petals. These little baby chicks cakes are colorful and cute. They are easy to make and even easier to decorate. You will need to use a mini doll cake pan to get the right shape and then it’s all about the decorating. You can make your own decorator frosting and then just cover the cakes in coconut that you color with yellow food coloring. These little cakes are adorable and because they are small, you can have several of them grouped together to create quite the centerpiece for your dinner table. 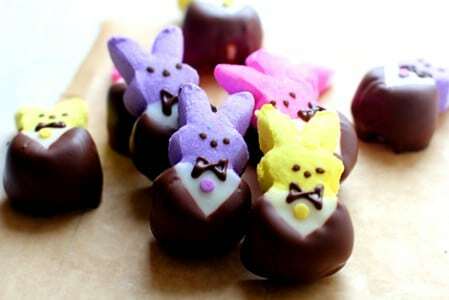 A little dipping chocolate and marshmallow Peeps in various different colors give you what you need to create these little tuxedo peeps that are entirely too adorable. Imagine your table with these little critters on them. You just have to create the tuxedo out of dipping chocolate and then add any other embellishments that you may want. It takes very little time to make a batch of these so think about making several batches and using them for baskets or gifts. If you are planning an Easter party or a huge egg hunt, these kebabs are just what you need. You will need kebab skewers and a few other treats aside from the marshmallow Peeps. You can use mini cupcakes, Rice Krispies treats, chocolate eggs or just about anything you want to create the kebab. Then just be sure to add a Peep every few pieces and decorate the other items that you are including. This is a great party treat and will look beautiful once it’s all put together. 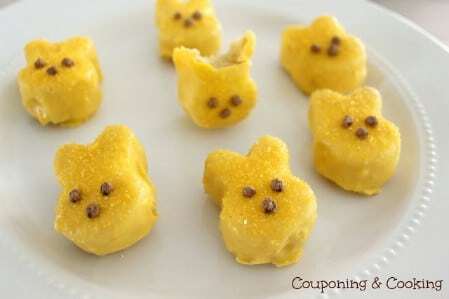 Marshmallow Peeps are the favorite of many and you can use those Peeps to create so many different yummy desserts and candies. 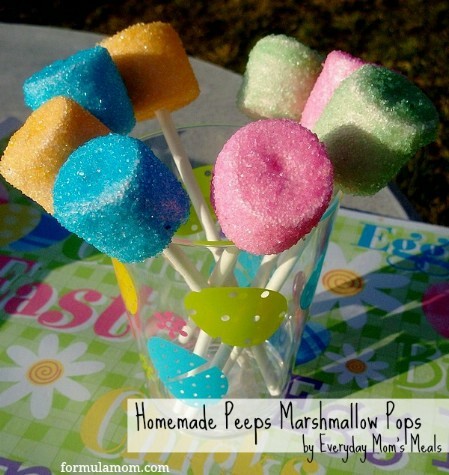 These Peeps Pops are not only delicious, they are very simple to make. You will need a few lollipop sticks as well as melting chocolate or white chocolate. 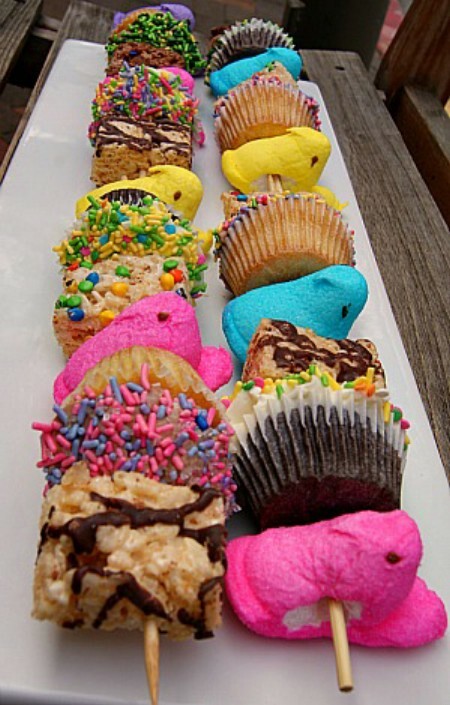 Once you have covered your peeps, feel free to decorate them with sprinkles or just about anything you want. You can display them in just about any way you want as well. This delectable cake recipe is a twist on the Italian classic Pizza Rustica. While the cake itself doesn’t have any tomatoes or cheese, it does have a great colorful inside. You have to chop up a few colorful Peeps (using different colors is great) and then add those to your cake batter. You can use a white cake mix like the one in the recipe or if you prefer, choose yellow, chocolate or any other flavor you want. Make these great cupcakes with your favorite cake mix flavor or recipe. Once the cupcakes are finished, you can decorate them with green colored frosting or use chocolate frosting and add green coconut. Add a few sprinkles or small jelly beans to look like Easter eggs and a marshmallow Peep that has been dipped in chocolate and then in sprinkles. Kids are going to adore these colorful and fun cupcakes and you can find the flag printables on the recipe site as well. Rainbow colors give these Easter cookies their appeal. While decorating these may take just a bit longer than normal, it is definitely worth it in the end. You just have to choose the pattern for your design and then choose a lot of different pastel or bright colors for decoration. You can make the cookies from any recipe that you want and then cut them into the egg shapes before you bake them. These eggs are yummy and beautiful. They take only about an hour to make and you can decorate them however you want so feel free to make them as unique as you like. 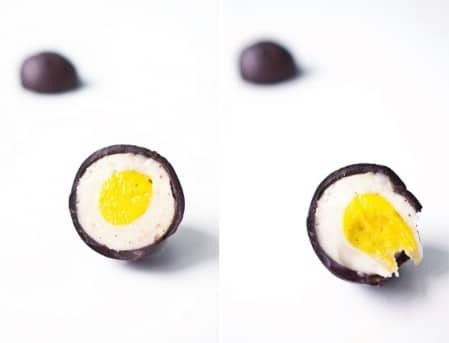 Each egg has a yellow yolk center which is a great surprise when you bite in and they use yummy ingredients like white chocolate, powdered sugar and marshmallow cream. You could also use chocolate instead of the white chocolate if you wanted and you can use different sprinkles and candies for decorations. 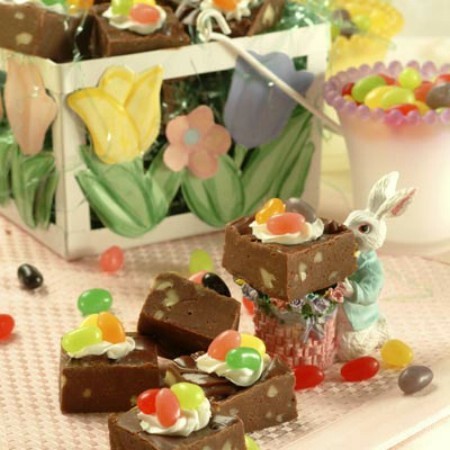 Delicious Toll House fudge gets a little spring pick me up in this Easter basket fudge recipe. The fudge is made normally, just like you would for any other occasion. What makes it great for Easter however is how it is decorated. Decorator icing and jelly beans will give you a beautiful basket on top and the great thing about this recipe is you can make it in traditional chocolate, milk chocolate, white chocolate or even butterscotch. 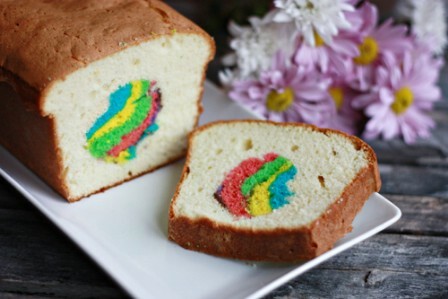 With beautiful colors inside, this pound cake recipe is sure to be a favorite for springtime. You use two boxes of pound cake mix or you could make up your own. 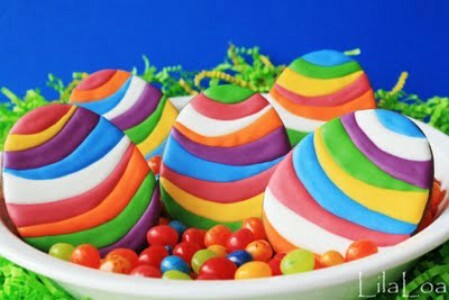 The colors are added before you bake so that when you cut into the cake, you get a beautiful colored Easter egg design. You could also do this in other shapes if you wanted but what’s better for Easter than a cake hiding a beautifully colored Easter egg inside? These cookies can be done in traditional Easter bunny shapes or you could do them in carrots or other shapes as well. Use all of those Easter themed cookie cutters. If you don’t have Easter cookie cutters, you can pick them up at Wal-Mart or your local hobby shop. Then you just have to bake and decorate, which is where the real fun and creativity come in. Decorate them with your favorite buttercream frosting or choose another method. It’s all up to you. Using Fruity Pebbles, you can make really colorful Rice Krispies treats that are perfect for Easter. 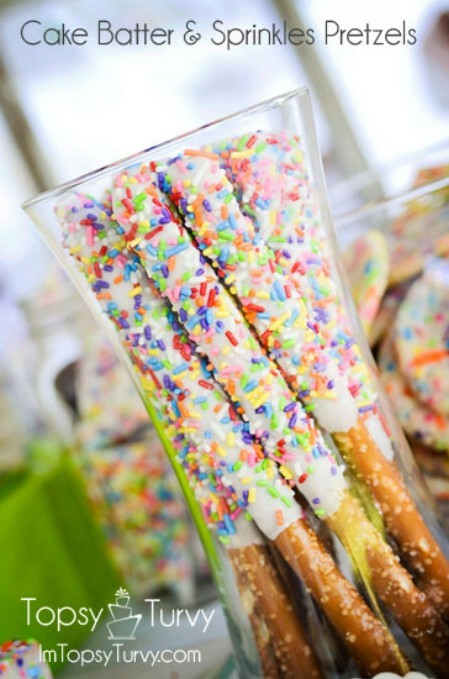 Dip the tips in white chocolate or regular chocolate and add a few sprinkles to make them even more colorful. 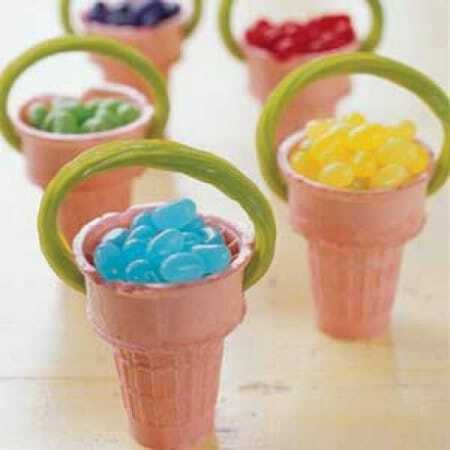 You can also attach a popsicle or lollipop stick and create a little bouquet out of these colorful and yummy treats. If you don’t have Fruity Pebbles or you just prefer regular Rice Krispies, just add pastel sprinkles to the mix. 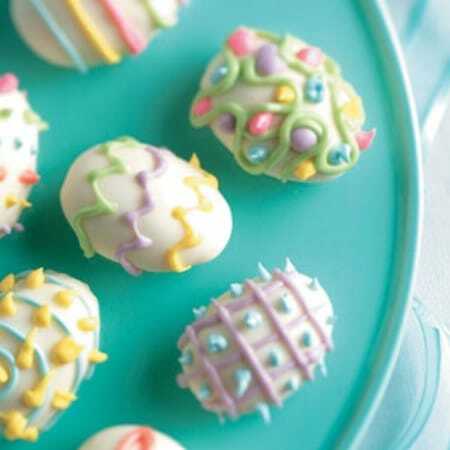 Grab some Oreo cookies, white chocolate and sprinkles and you can create these adorable and oh-so-yummy truffles just in time for Easter. You will also need cream cheese and a few other ingredients and supplies. These are perfect for adding to homemade Easter baskets and are great for treats at your party or egg hunt. They are so easy to make, you may just want to have a batch on hand for a quick bite throughout the day. Cake pops are very popular and you can do so much with them. Take these hatching chicks for instance. They are easy to make and are so adorable. You use candies like candy corn to decorate and white chocolate gives you the perfect basis for cracked eggs. 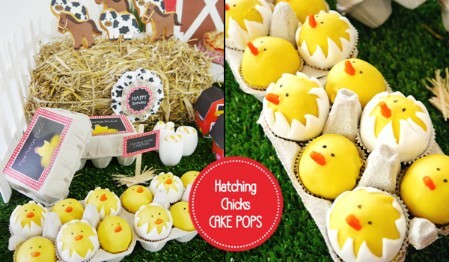 Your kids are simply going to love these whimsical cake pops and you can display them in an egg carton or create a little bouquet from them. 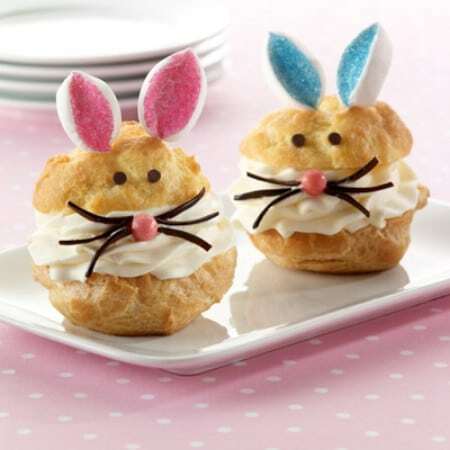 These cream puffs are both delicious and adorable. Made to look like little bunnies, the inside of the cream puff is filled with white chocolate flavored pudding and whipping cream. Talk about your heavenly desserts! 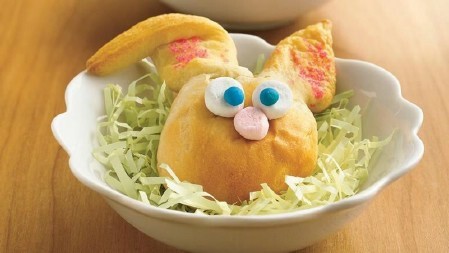 You can make these for Easter brunch or dinner or to have on the table for your egg hunt or party. They are perfectly versatile and absolutely delicious. 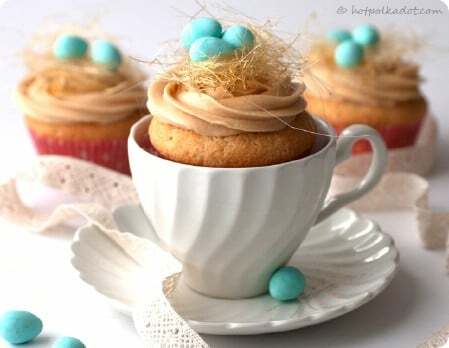 Once baked, you can place these yummy cupcakes in coffee mugs and decorate them to look like little bird’s nests. These are perfect for Easter brunch dessert and can be decorated in a number of different ways. The caramel makes them delicious and you can top them off with Whopper’s robin’s egg candies to give them a real nature look. The nests are made from spun sugar which is very easy to do and will come in handy with future cooking projects. Ok, so this recipe really doesn’t have anything to do with carrots – aside from how it looks. You make these with chocolate covered strawberries which are amazing and then you decorate them to look just like carrots. Imagine the cupcakes and cakes that you can decorate with these or you could just leave them sitting out in a bowl to look very Easter-y. You can also do these to look like Easter eggs. Chocolate and Easter go hand in hand. You simply must have chocolate on Easter and what better way to enjoy that yummy chocolate than to make it yourself? These Easter chocolates are absolutely divine and you can make mint flavors or any other flavor you want. 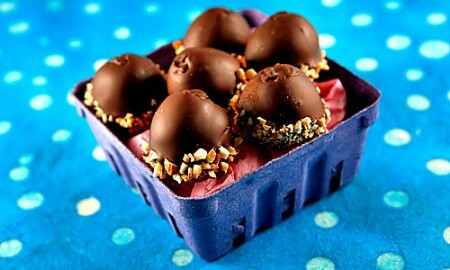 Shape them to look like Easter eggs so that they go well with your other homemade treats. They are great for baskets or you could just have a dish on hand to greet guests to your dinner or egg hunt. 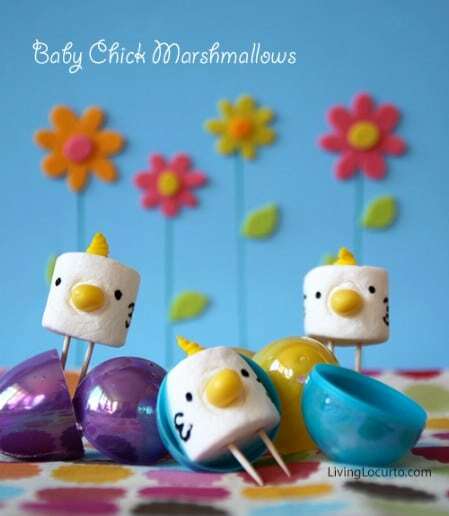 These adorable marshmallow Peeps will really be a hit when you serve them in chocolate egg shells. You mold the chocolate around a balloon and then just pop the balloon when it’s ready so that you have a hollowed out egg shell that is ready to hold your peeps. Decorate your chocolate with sprinkles or other embellishments before you allow it to harden and then just sit those Peeps down in their little shells. Remember those delicious coconut cream eggs when you were younger? Well, now you can make them yourself and show your kids just what they’ve been missing. This recipe is very simple and makes delicious chocolate eggs that are stuffed with coconut cream filling. You could play around with the recipe and use other fillings if you want or make batches of dark and milk chocolate as well as white chocolate eggs. You can make these colorful cookies using homemade or store bought cookie dough. You will need to color the dough before baking and once they are cooled, you fill them with decorator icing and embellish them with green coconut, jelly beans or even better, pastel colored Jordan Almonds. The baskets are rolled in colored sugar before baking so they have that yummy sugar cookie taste and they are baked in a mini muffin pan to get the perfect shape. What could possibly be better than homemade marshmallow Peeps? Why, colorful Peeps pops of course. You start with large marshmallows and then add the sugary goodness that makes Peeps so popular. You can do them in a multitude of different colors and create a stunning display or centerpiece with your homemade treats. You could also use these for baskets or for party favors at your egg hunt. After all, everyone loves Peeps. If you are a huge fan of chocolates, this Lindor truffle recipe is for you. The truffles are so easy to make and perfectly resemble those by Lindor themselves. If you are planning a brunch, these would be great on the table or you can use them to fill a homemade Easter basket. You can make them in dark or milk chocolate or do a few in white chocolate and decorate with sprinkles to make them a bit more colorful and Easter like. Imagine being able to make your own homemade moon pies. This recipe lets you do that and not only that, it helps you to make those moon pies in the shape of Easter eggs that you decorate. They are delicious and you can decorate them however you want – with sprinkles, candies or with decorator icing. Put them on lollipop sticks to create a nice bouquet of Easter eggs or you can just leave them on a plate – although they probably won’t last long wherever you put them. A nest of white chocolate and baby chicks made from white chocolate as well – this delicious recipe is just filled with white chocolate goodness. It’s relatively easy, although you will need to mold the baby chicks into shape. You could also do other characters if you wanted. 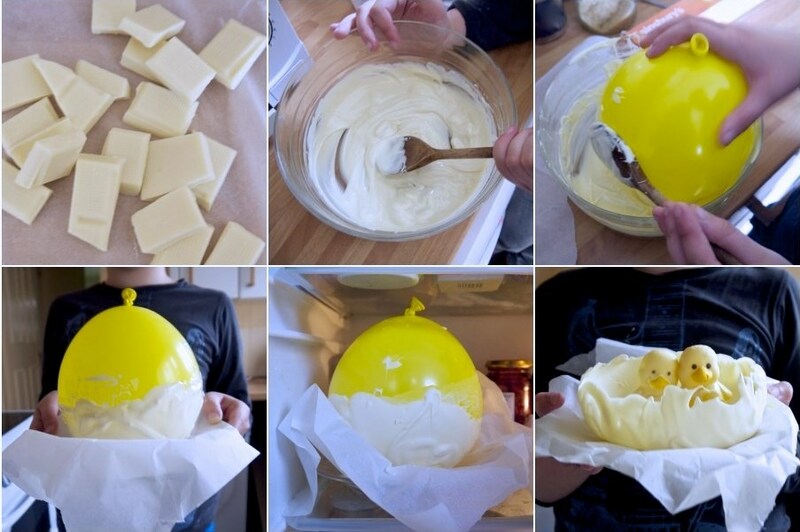 The white chocolate nest is really easy and requires just shaping melted chocolate around a balloon to set. 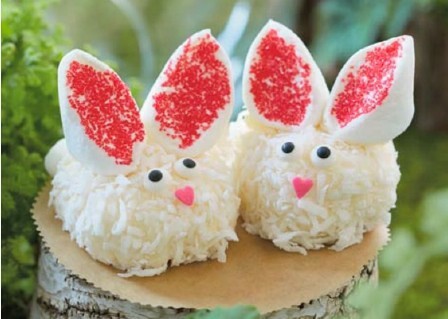 You can make your own delicious snowball cakes and decorate them for Easter. These little cakelets are very similar to snowball cakes made by Hostess and they are easy to make and delicious. Coating them in colored coconut makes them even yummier and gives them a beautiful spring color. You could do them in multiple paste colors and even play around with the recipe if you wanted to stuff or fill your cakes with chocolate or cream. These little cakes look just like marshmallow Peeps and even have that great sparkly sugar on the outside. You can make them with a bunny shaped cake pan or you could be creative and use other methods of forming the cake. 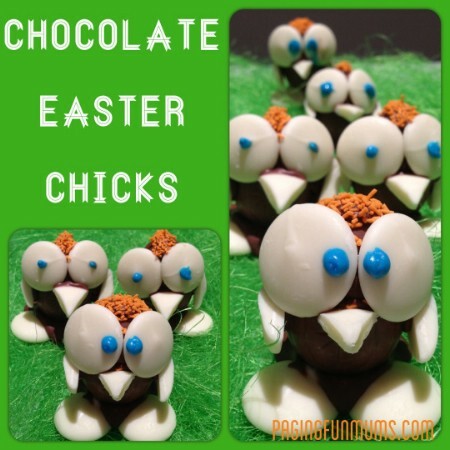 A little cool whip mixed with cocoa powder was used to make the eyes and noses on these little guys and overall, this is a relatively easy and very yummy treat for you to make. Candy corn in pastel colors can be used for petals to create these pretty and very delicious candy corn flowers. 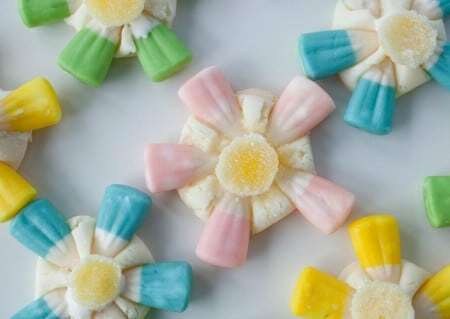 The candy corns are held together with white chocolate candy melts and homemade gumdrops serve as the center of the flower. These take very little time to make and you can do them in so many different pastel colors. They are the perfect treat for those of you who love a little sweetness and you could stick them on lollipop sticks and create a bouquet from them. 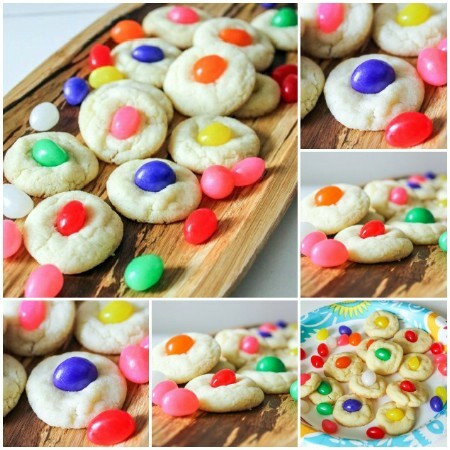 A colorful jelly bean in the center of these sugar cookies makes them the perfect Easter treat. The cookies take just a few minutes to prepare and bake and the jelly beans give them just the right splash of color. If you aren’t really a fan of jelly beans, you could also use Whopper’s robin’s eggs or Cadbury mini eggs to highlight the center and give them a completely different taste. Not all Easter treats have to be filled with sugar. You can create treats that are just as healthy as they are cute and delicious. These frozen yogurt eggs are the perfect example. 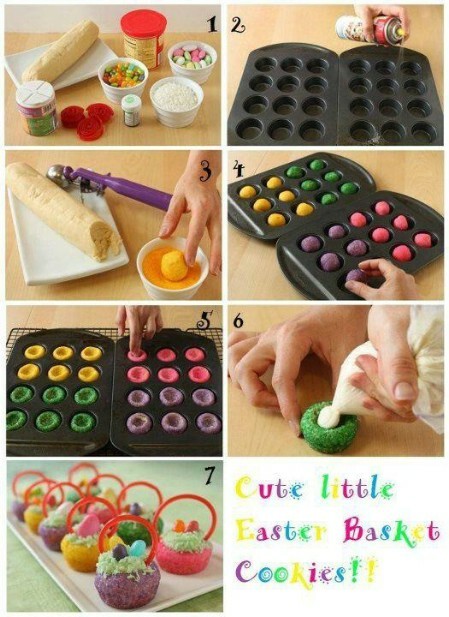 You will need a silicone mini cake pan in the shape of Easter eggs to create the egg shape. The yogurt includes vanilla flavored yogurt (or you could use other colors if you want) and fresh or frozen fruit to make it even more delicious. While you won’t likely be able to decorate these eggs, the kids are sure to enjoy eating them. If you want something a bit different for your Easter celebration than the traditional bunnies, eggs and chicks, these butterfly cupcakes are perfect. The butterflies are made from pretzels and decorator icing and have M&M candy heads and licorice antennas. They are adorable and very yummy and you can do the cupcakes in your favorite flavor and even be a bit creative on the icing flavors as well. 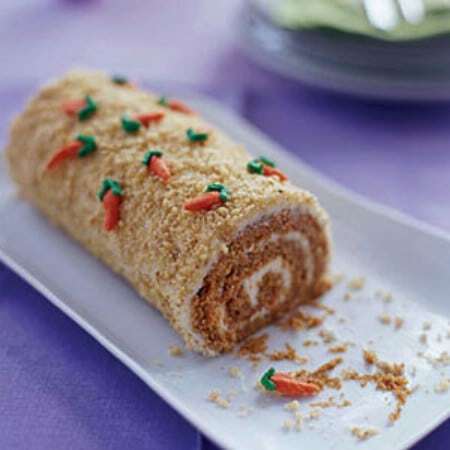 This carrot roll is made much like a pumpkin roll but has a wonderful carrot cake flavor. You can decorate the outside with little carrots made from candies or just however you want. This is the perfect cake to accompany your brunch or it works great as a gift for someone who loves carrot cake. If you want a dessert that is not overly sweet (and even one that has veggies inside) this one is perfect. 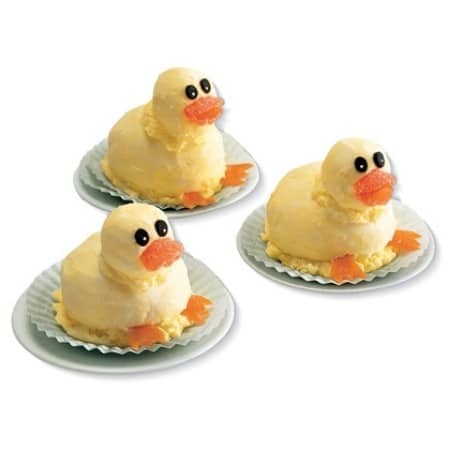 These little ducky’s made from ice cream are simply fabulous. There are just a few short steps to making them and kids are sure to love the look as well as the flavor. You will need to make these a little ahead of your brunch or dinner to ensure that they have time to set up properly. There are many different ways to embellish them and you can use any ice cream flavor that you want. These cupcakes have the yummy goodness of cake and icing combined with a lollipop to make them extra colorful and special. The frosting has a meringue base which makes it delicious and you can top the cupcakes with sprinkles or other decorations before inserting the lollipop. The lollipop creates a flower which you can embellish with leaves made from taffy tape or you could pipe them on with decorator icing. 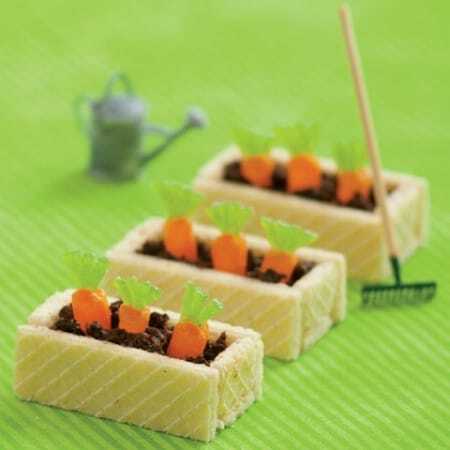 Cute little carrot patches are created by using sugar wafers. The wafers are held together with chocolate frosting and the “dirt” is created with chocolate wafers. You can create carrot candies with Mike and Ike candies and green gummies that you cut to create the carrot tops. These are adorable, easy to make and include many yummy ingredients. 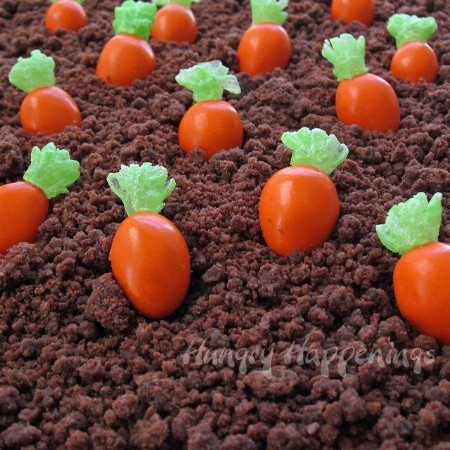 Kids are sure to want to help create their own little carrot patches and of course they will love eating them as well. This homemade bread has an Easter egg baked right in the middle. Some recipes are geared toward actual dinner breads while others can be on the sweet side. Whatever your preference, you are sure to be remembered for this beautiful bread. You can bake these in smaller versions and have one for everyone at your brunch or Easter dinner. Put an egg of a different color in the center of each and decorate with sprinkles for an extra-special touch. These bunny puffs are made from refrigerated crescent dough, mini colored marshmallows, chocolate chips and chocolate covered peanut butter cups. They are as cute as they are delicious and are sure to please every child in your house (as well as the adults). They are also very easy to make and you can actually decorate them however you want. They work well for brunches and dinners or you could just have them for a quick after school snack. 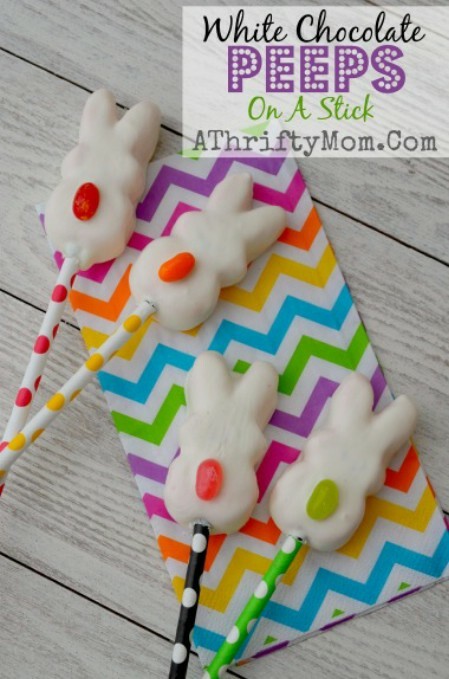 Simply covering marshmallow Peeps in white chocolate and putting them on a lollipop stick gives you a wonderful treat that is sure to please. You can decorate your little Peep pops with any number of sprinkles or other edible embellishments. These are so easy to make and you can actually do them in different colors if you want to add food coloring to your white chocolate or do them in regular chocolate and cover with sprinkles. If you have never tried gorp then you are in for quite a treat. Made with white chocolate and paste colored M&Ms, this yummy Easter themed treat is sure to be a hit at your egg hunt or party. It’s also very healthy and contains nuts, berries and many other good for you treats. You can make this ahead and serve in a large bowl or put it into smaller bowls or baskets for a real Easter themed treat. 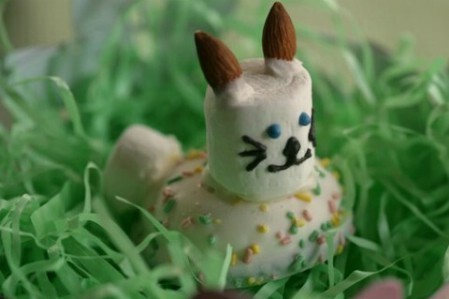 This great (not to mention yummy) Easter Bunny is made from white powdered sugar donuts. Jelly beans and sprinkles decorate him perfectly and you can use the mini donuts like shown or you could make him a bit larger and use regular sized donuts if you want. 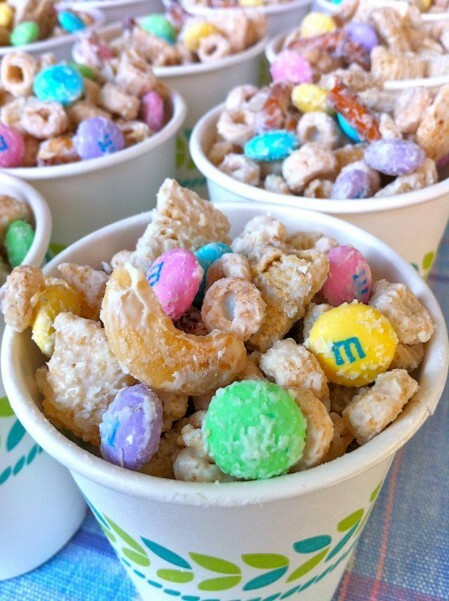 This is a great Easter breakfast idea to really get the kids in the Easter spirit or it would make a great snack before bed. 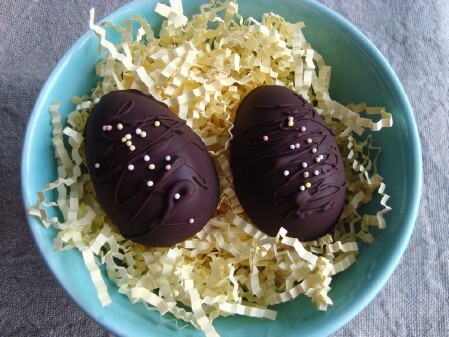 These eggs resemble homemade Cadbury’s eggs but the filling is actually cheesecake. Imagine the yumminess of cheesecake encased in luscious chocolate. You can also try different variations of the recipe like passion fruit that is really delicious. The eggs are hollow and contain such a delectable center filling that you are sure to want to make more than one batch of these. 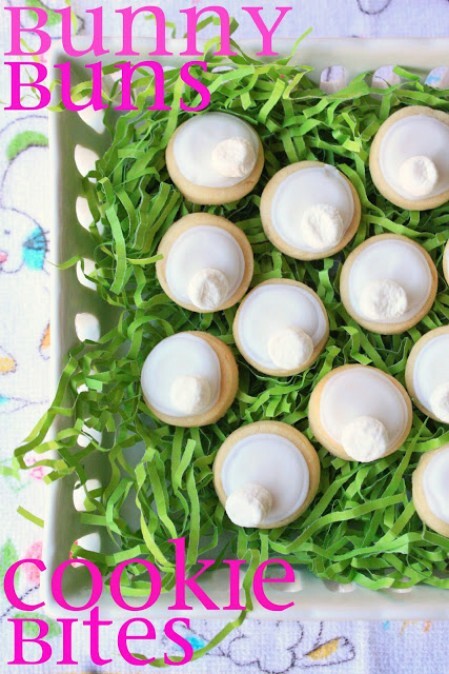 These peanut butter buttons are perfect for those Easter parties. You just need mini pretzels, white candy melts and Reese’s Pieces pastel eggs. 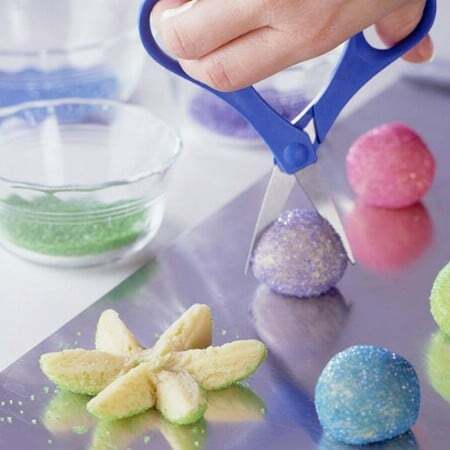 You can use sprinkles and other candies if you want for decoration. The gist is to simply hold the Reese’s pastel eggs on the pretzels with the melted candies. You can use white chocolate or regular chocolate in place of the candy melts if you want or substitute M&Ms or other candies if you aren’t a fan of peanut butter. 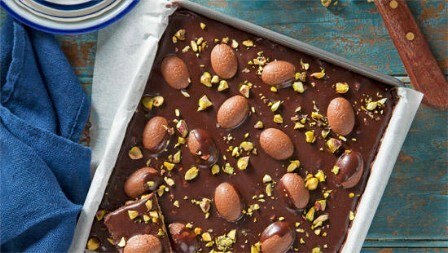 Delicious doesn’t begin to describe this heavenly dessert that uses shortbread, dark chocolate, pistachio sand caramel filled Easter eggs to create a luscious chocolately treat. This is the perfect dessert choice for those of you who really love chocolate and is great for brunch or dinner. You may just want to make it to have at home for whenever those chocolate urges hit. It just takes about 20 minutes to put together and it is recommended that you allow it to chill overnight so make it the night before. 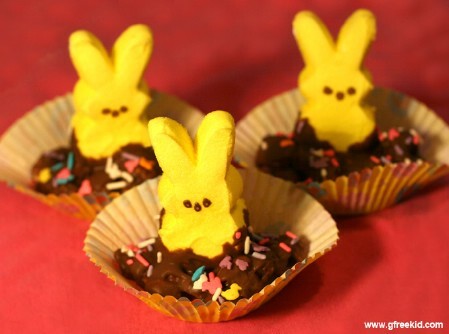 You can use Peeps for so many wonderful and decorative treats. These skateboarding Peeps are as yummy as they are cute. The skateboards are made from Nutter Butter type cookies and the wheels are white Life Saver candies. 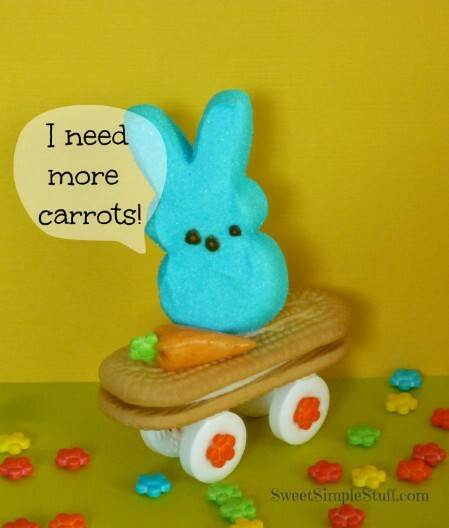 You can embellish the Peeps and the skateboards with other decorative candies as well. The Peep will stay on the skateboard if you put a little decorator icing on first. 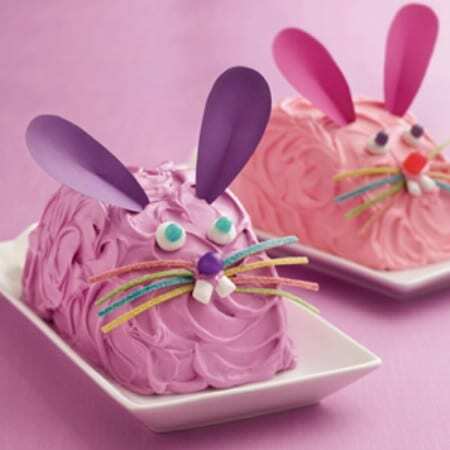 Delicious cheesecake formed into adorable bunnies is sure to be a huge hit at any Easter gathering. The bunny ears are made from marshmallows that are cut and formed and the bodies are covered in shredded coconut to give them a furry appearance. You can make several of these and have them gathered together on a bed of green coconut “grass” or stick a toothpick in them with a flag to use as place settings. Cadbury Crème Eggs, cooking chocolate, white chocolate buttons and sprinkles are combined to create these adorable little Easter chicks. You will also need blue icing gel or you could whip up your own blue decorating icing if you wanted. Orange sprinkles make the top of the head while the white chocolate buttons are used for the eyes – combined with the blue icing. These are fast and easy to put together and a great project for kids. You can be very creative. Making them is nearly as fun as eating them. 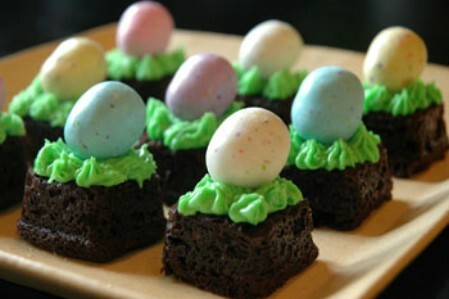 These little chocolate brownies get an Easter pick me up with green decorator icing on top that houses a Whopper’s robin’s egg. You could actually use any type of egg shaped candies that you want. Cadbury’s mini eggs are a good choice or you could use jelly beans as well. You can either bake the brownies in a pan that makes them bite sized or bake them in a regular pan and cut them before you decorate. These little chicks are the perfect sized for individual cheese ball servings. They sit nicely on a Ritz cracker, although you can use any type of crackers that you want. 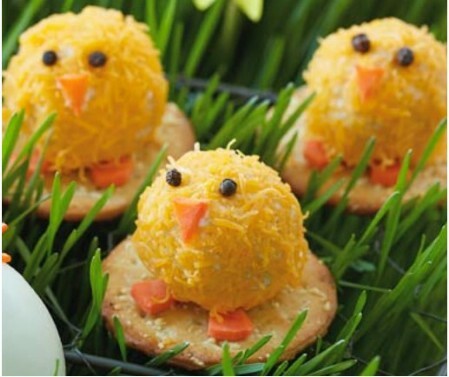 After you create the cheese balls, you simply roll them in finely shredded cheddar cheese – or any yellow variety – to give them the chick coloring and then decorate with carrot pieces cut into appropriate shapes and sizes. The recipe makes about 20 small chick cheese balls. 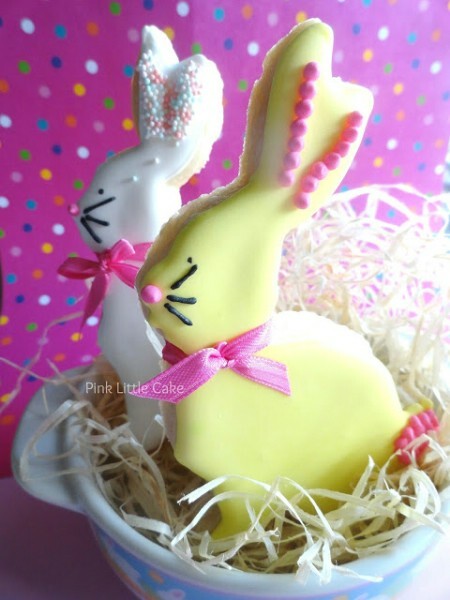 These adorable little cookies are meant to resemble the cotton tail portion of the Easter bunny. You simply bake cookies in your favorite flavor or from your favorite recipe and then decorate with a small marshmallow for the tail. You will need to mix up a batch of royal icing to keep the marshmallows in place and you can house them on a bed of green colored coconut. Kids will adore these whimsical cookies. 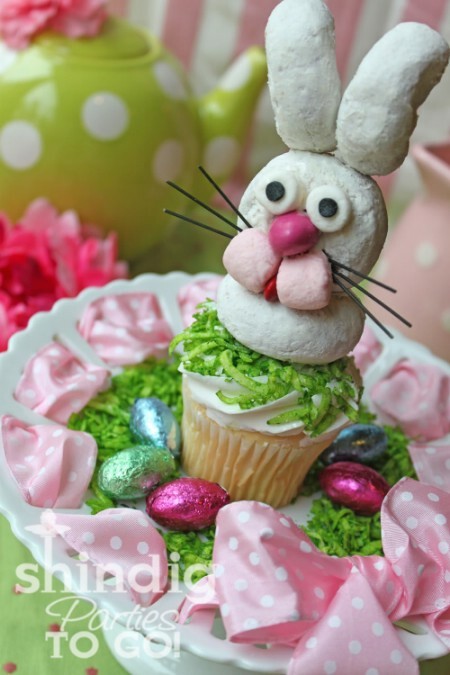 In about half an hour you can create these adorable Easter Bunny cakes. Each recipe makes 2 cakes so this is a great recipe for those who actually need 2 different cakes. If you have more than one party planned or you just want to make sure that you have plenty of cake on hand, this is a great recipe. Creating the bunnies from the cake is really simple and you can use your imagination when it comes to decorating. Be sure to lay your bunnies on a bed of coconut with green food coloring to resemble grass. 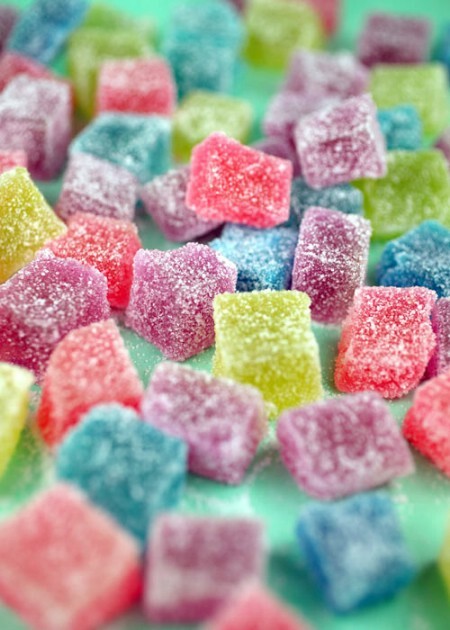 Gumdrops are yummy and very easy to make. You can create beautiful pastel colors for your Easter gumdrops and these are great for decorating cakes and cupcakes or perfect for just eating by themselves. Make them in a host of pastel colors and use them to dress up your Easter baskets. They also make great gifts for those who like them so think about sharing with others. This beautiful spring garden cake looks so complicated to make. Only you will know how really easy it was to create. The great thing about this is you can use whatever cake flavor you want. Once the cake is baked, you just ice it and then decorate which again, is much easier than it looks. The “dirt” is simply crushed Oreo cookies which give the cake even more yumminess. 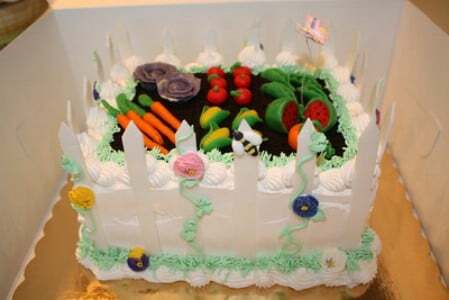 The grass is created with buttercream decorator frosting and the veggies are all made from marzipan. This is not your traditional carrot cake. In fact, it really doesn’t look like a cake at all but it sure tastes like one. The carrot shaped cake is covered with frosting and then with orange jelly beans to give it the right color. 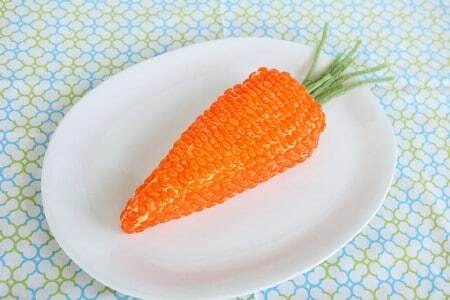 The greenery at the top of the carrot is made from strips of licorice or gummy candy. You can do this in any cake flavor that you want. You could even do it in a carrot cake flavor. Small mini donuts covered in white powdered sugar give these Easter bunny cupcakes their look and their yumminess. You just have to bake the cupcakes in whatever flavor you want, ice them with white icing and then put together the little bunnies. Green colored coconut works well for the grass and you could add jelly beans or other colorful candies on top of the cupcake for a little added decoration. The bunnies have marshmallows as facial features and the whiskers are made from angel hair pasta that is painted black with food coloring. 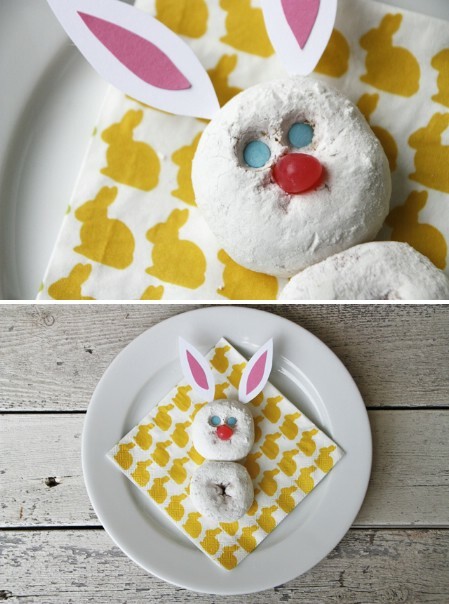 Kids will absolutely love these little puff bunnies that are all dressed up for Easter. These are really easy to make and the kids can help. You need Little Debbie Marshmallow Easter Puffs for the body and then almonds, marshmallows and a few other ingredients for the decorations. These are perfect for last minute treats because they take literally minutes to put together and are sure to be a huge hit with kids and adults alike.